Useful Enemies began as an in-depth look at the criminal case against Ivan (John) Demjanjuk, a former World War II guard at the Sobibor death camp in German-occupied Poland. American Nazi hunters found him living and working in Cleveland, Ohio. The Justice Department charged him with lying on his visa application and sought to have him deported. I felt the Demjanjuk story was important for several reasons. He wasn’t a Nazi. He was a Nazi collaborator and one of approximately 5,000 Soviet POWs trained by the SS to work at Nazi camps. 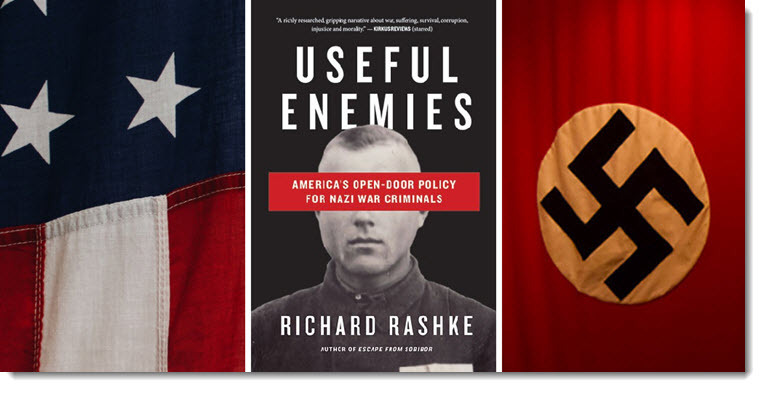 Before Demjanjuk’s trials in Cleveland, Jerusalem, and Munich, Americans knew little about who the approximately 200,000 European Nazi collaborators were and what crimes they committed. Furthermore, Demjanjuk’s American and Israeli trials illustrated the risk of relying too heavily on eyewitness testimony. And Demjanjuk’s Munich trial, which I attended, set a precedent in German jurisprudence. For the first time, a German court ruled that aiding and abetting in the killing process was a crime, even if the defendant never pulled a trigger. Finally, John Demjanjuk’s Munich trial was ostensibly the last high-profile war crime trial of the Nazi-hunting era. I stopped writing and spent hours sitting quietly in my favorite chair, listening and taking notes. The missing dimension eventually became clear. With the approval of the White House and the Departments of State, Justice, and War, the U.S. Joint Chiefs of Staff sent General Dwight Eisenhower, commander-in-chief of the Allied Forces, a secret directive dealing with the postwar governance of Western Europe. Buried in that directive was the authorization to secretly recruit known and suspected Nazis and their criminal collaborators to help America fight the new Cold War. The Truman White House and the military-intelligence complex covered the extensive use of war these criminals under the label “highly classified” as well as a tissue of lies. As a result, the Eisenhower directive remained secret for more than forty years. The more I uncovered the extent of the lies, the more nervous I became. I found Cold War program after program relying heavily on thousands of Nazi war criminals and their collaborators worldwide. (The actual number will never be known either because accurate records were never kept, or the documents were lost, or the records are still buried.) I concluded that from 1945 to the collapse of the Soviet Union in 1991, the U.S had continuously committed the international crime of obstruction of justice by hiring and protecting thousands of war criminals instead of handing them over for prosecution. America’s pragmatic use of mass murderers raises an important question: Was it a legitimate application of the principle, “The end justifies the means?” Or did America cross an ethical and moral red line? I went back to my draft of Useful Enemies and wove into it the obstruction theme. Then I added the subtitle, America’s Open-Door Policy for Nazi War Criminals. I have left the ethical question for the reader to decide.